Is Your Neck Pain From Texting? Do you experience neck pain? Do you spend a lot of time on your smartphone? How much time every day are you spending texting, playing games and apps, doing searches? Have you ever thought about neck pain from texting? The Journal of Behavioral Addictions recently published a study stating young adults spend about 10 hours per day doing activities on their phones. Look all around you! At the mall, sitting at a restaurant, on the subway, just walking across the street almost every person you see is texting away. This outright addiction to cell phones has a major impact on your neck. This can lead to sprain, strains, headaches, pressure on your discs and nerves leading to numbness and tingling down your arms and into your hands. These problems are only going to become more chronic if not more aware of the accumulative stress put onto the head and neck. When your body is properly aligned and has good posture, the opening of your ears should be centered aligned with your shoulders. Your shoulders should not be rolled forward. Your head weighs 10 to 12 pounds which to put in perspective is about the same as an average bowling ball. Imagine holding the ball: would it be easier to hold it in tight close to your body or out at arms length? The further you hold the ball out in front of you, it’s more difficult to hold it for a long time and you start to feel pain. This is the same effect when you sit with your head tilted forward and hanging down. Try sitting and just let your head fall forward and stay in that position for even just 30 seconds. You will start to feel strain and discomfort building in your neck and shoulders. For every inch forward your head is positioned from the neutral posture, it exponentially increases the forces. Dr. Hansraj found the increase of pressure for the increase in neck angle as per the picture below. This puts an extreme amount of pressure on your neck while trying to hold it up. 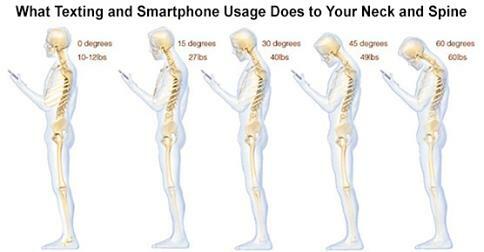 No wonder you get neck pain from texting! You can take some simple steps to help reduce the pain from texting. Correct your habits of posture by being more upright and holding your phone in front of you. This prevents you from bending your neck in a straining position. Also reduce the amount of time you are spending on your phone. Most important is making sure your spine is properly aligned with regular chiropractic care. Prevention and maintenance is beneficial so you don’t experience chronic pain and degeneration. If you experience neck pain from texting contact Freehold Chiropractor, Dr. Russell Brokstein or find a chiropractor near you. Please comment and share this article with others. Ankle Sprains Helped with Chiropractic! Ankle sprains are very common among athletes. Usually once you sprain the ankle, it is common to have recurrent injuries. More than 40% of inversion ankle sprains result in chronic instability. It’s important to get treatment quickly and effectively. A study published in the Journal of Manipulative and Physiological Therapeutics (JMPT) shows chiropractic adjustments along with rehabilitation shows some of the best outcomes. Short term outcomes were compared for 33 students who suffered with recurrent ankle sprains. They were split into those receiving just rehab and those receiving chiropractic plus rehab over a 4 week period. These patients were assessed for level of pain and disability. The rehab group were assigned specific ankle exercises to perform daily while the other group also received 6 chiropractic treatments. The patients that received both rehab and chiropractic adjustments showed significant short-term reduction in pain and the number of joint restrictions in the short-term. The improvement of disability was the same for both groups. I was a competitive soccer player who severely sprained my ankles multiple times and even dislocated my ankle once. I suffered for years with recurrent problems until getting under chiropractic care. 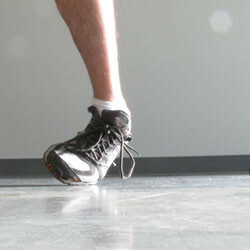 I have experienced first hand the benefit of adjustments to improving pain and disability of ankle problems. Also, if you have low back pain it can be from chronic ankle conditions. By addressing the ankle misalignments, your lower back pain can be relieved more quickly.